The SmartWater Foundation is working in partnership with the War Memorial Trust to locate, log and protect as many of the 100,000 war memorials there are in the UK, providing all the products, services and support, free of charge. Frequently, war memorials are the only remaining public record of those who made the ultimate sacrifice in armed conflicts and are a physical representation of the Community’s pride, grief and commitment to remembering them. Many were paid for by the communities themselves and have remained the focal point for Remembrance Day parades for decades. Sadly, in recent years, a considerable number of these memorials were stolen by thieves who sold them as scrap metal, but the extra protection provided by the application of a unique SmartWater® forensic solution reduced theft to almost zero. HRH The Duchess of Cornwall is Patron of our partners the War Memorial Trust and has actively supported In Memoriam 2014 including, on occasion, applying SmartWater to a number of high profile, historic memorials. 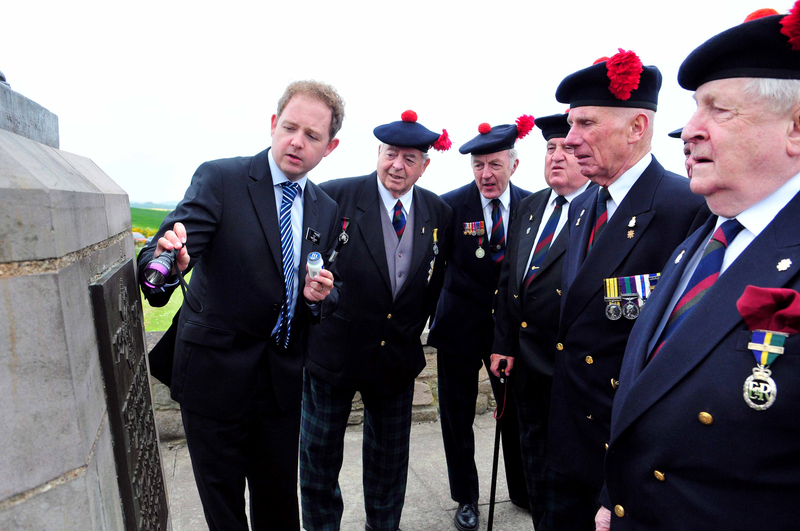 Veterans from the Black Watch at their Regiments memorial hear how SmartWater works.